As I was relaxing by the pool in St. Lucia over our December vacation and thinking about starting my 52 Pizzas project, I never imagined that I would make the fifty-second pizza in early September. 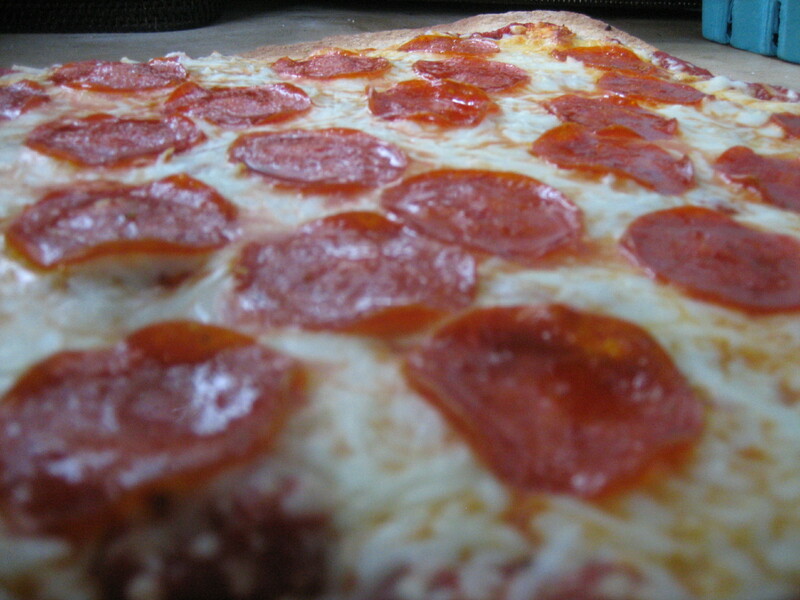 I prepared a mental list of all the pizzas I hoped to make and of course pepperoni pizza was on the list, but I have been having so much fun creating original pizzas that this one kept getting pushed down my list. Until last weekend, that is when I decided I couldn’t make 52 pizzas and not include my own pepperoni pizza recipe! When preparing this pizza I reminisced about my first job, at Sbarro, where I learned how to toss pizza dough, spread marinara using a ladle, and the proper arrangement of pepperoni. For my pepperoni pizza recipe I bought Italian style pepperoni that had a red pepper spice to it. I spread marinara sauce on the dough, sprinkled on mozzarella cheese and laid the pepperoni in concentric circles around the pizza. The pizza turned out delicious and was such a simple and satisfying way to end my project. This has been a great experience. I enjoyed the creative process and the challenge of developing so many new recipes. I am proud that I made my dough from scratch on all 52 pizzas. It has also been fun sharing the process with others. Andrew and I look forward to pizza every week. We have enjoyed pizza with the company of so many family and friends. In addition, it has been tons of fun to share my pizza creations on this blog. I never imagined how many people would be interested in this project when it began. Now that I’ve completed 52 pizzas I am planning my next pizza project and will write about in the next week. Stay tuned!